Check Out Our Full Randolph Engineering Selection in Edmonton, Alberta! When a split second counts, you want every possible edge. Change the way you see orange with ColorMag™ (CMT) lenses. See up to 250% more orange light than a standard lens without affecting other colors. 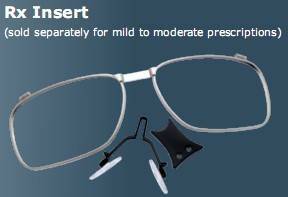 This lens technology is available exclusively from Randolph Engineering. Avid outdoor enthusiasts can now use one frame for everything under the sun. The new ALLSport™ Polarized Lens Series for the Ranger XLW™ will protect your eyes from impact, distracting glare, and much more while improving contrast and reducing eye fatigue. Can your sunglasses do that? This is serious style for serious shooters. Designed from the ground up by our team of experienced optical engineers, the XLW™ is the industry’s first 8-base wrap frame specifically made for sport shooting. While some wrap eyewear may distort your vision, the XLW lenses are always 100% distortion free. For an added edge, the optional military inspired bayonet temples are designed to fit comfortably under any headwear or ear protection. Combining protection from both projectiles and harmful UV radiation, the Ranger Edge helps you keep your eyes on target and your aim true. Randolph Engineering Ranger Edge features lenses that are perfect for sharp vision even if you need prescription eyewear. As Randolph Engineering’s first shooting frame, the Ranger set the standard for safety, comfort, and target enhancement. Its lightweight, high-tech alloy frame with dual-action spring temples is made for all-day comfort and maximum durability. For those who know the difference between superior performance and passing fashion, the Ranger continues to be the classic choice for shooting eyewear. A note for opticians: This style is also available with straight eye prongs that can be bent to fit thicker prescription lenses. Call 800.541.1405 for more information. From any shooting discipline to fishing and hunting, quality lenses will not only protect your eyes from numerous hazards, they’ll actually elevate your performance and prevent your eyes from becoming fatigued. 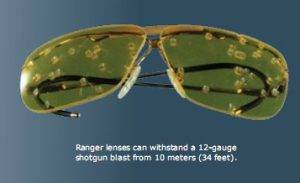 Those who are serious about the quality of their vision depend on Ranger lenses to perform, no matter the goal. 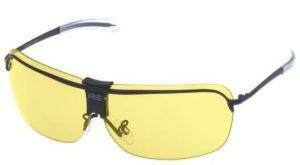 Although all Ranger lenses absorb 100% of UV rays and are molded at above industry standard thickness for your protection, the best advantages to wearing our lenses are enhanced definition and optical clarity. Unlike other shooting lenses, Rangers are made with distortion-free optical-grade polycarbonate. 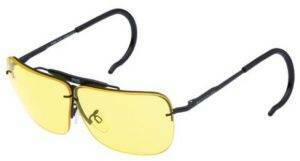 This gives you the level of protection you need while not compromising the quality of your vision. We don’t have flashy names for our basic lens tints- An orange lens is called “Orange”. This straight-forward approach is designed to assist you in choosing the correct lens tint for any given situation. With over 15 tints to choose from, you can be sure you’ll find the tints you need to enhance your performance. Confidence Level - What tints have you used in the past? 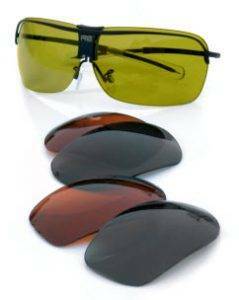 Most likely, the tint you’re most accustomed to will give you the most comfort and confidence while shooting. Light Conditions - The trick is to get your eyes as focused as possible. Your pupils regulate the amount of light that enters your eyes - just like a camera shutter. In low light, your pupils enlarge to allow more light into your eyes. As a result, your eyes become less focused. In bright light, your pupils decrease in size and allow your eyes to focus on distant objects. A simple rule to get maximum focus on a target is to use a lens tint that lets as much light in as possible without squinting your eyes. To follow this rule, you’ll need different lens tints to use in varying light conditions. Background - What background are your targets in front of? You’ll want to use different lens tints according to the colors of your background to highlight your target. For instance, if you’re shooting orange clay targets in front of green trees, you’ll most likely want purple or vermilion lenses that dull greens and highlight oranges. If your background has glare, such as water, you’ll most likely want to use a polarized lens. See the tint descriptions on the next page as a guide to help you choose the lenses that are right for you. Medium Yellow (our most common yellow tint) is highly effective at highlighting orange clay targets and upgrading contrast when light is minimal. Brown is ideal for diminishing light under very bright conditions and for identifying the brown hues of game birds. Vermilion is extraordinary for shooting when you’re surrounded by bright greenery. It spotlights orange hues while toning down the green, and it gives people with color vision deficiency a new edge on shooting well. for those with red-green color deficiency. orange targets against a deep blue sky. targets, but is useful in bright sunlight. Not recommended for bright conditions. All Randolph Engineering frames and lenses available through Dr. Barry Nolt. View the full Randolph Ranger Catalog.